We know in Battle of Gods the team of Z fighters will face a super strong enemy with Bills. They will all great pushed much further than ever before. Goku will hit SSJ 3 or maybe 4 but from the latest picture of the movie it looks like Vegeta will put up a big fight too. 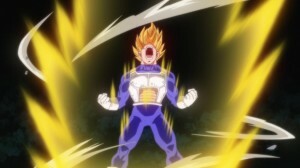 Is this Vegeta approaching SSJ 3 or just a powered up level 2?